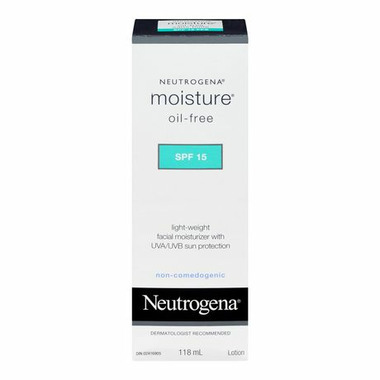 Neutrogena Moisture Oil Free SPF 15 combines long-lasting moisturization with effective sun protection. This non-greasy, dermatologist-tested lotion keeps skin moisturized all day. Broad-spectrum UVA/UVB SPF 15 sunscreens protect skin from sun's harmful rays. Sheer formula absorbs quickly into skin leaving it softer and smoother. Lightweight lotion keeps skin moisturized all day. Broad-spectrum UVA/UVB SPF15 sunscreens help prevent premature signs of aging caused by everyday exposure to sun’s damaging rays. Oil free formula absorbs quickly and won’t clog pores. Neutragena is a trusted product and , indeed, I am happy with this purchase. As my daily moisturizer , it is excellent under make up or not. Obviously, if one goes to the beach, a higher SPF is needed.